The 56 rooms, suites and apartments at the Hotel Atmosphères are designed according to a variety of different themes, leaving guests truly spoilt for choice. These themes are based on different facets of the city, such as “Palace”, “Urban”, “By Night” and “Monuments”. To match the individually customised hotel rooms, the architect decided on a bathroom collection that offered maximum flexibility, for all the bathrooms: Axor Bouroullec. Its slogan is “Feel Free to Compose”. This enabled Vincent Bastie to carry his individual room concepts right through to the bathrooms. The designer, who is responsible for several other successful designer hotels both inside and outside Paris, took full advantage of the open system of Axor Bouroullec. The integrated shelving, in various heights and sizes, and the flexible positioning of the mixers are both typical of this bathroom collection. This enabled him to make optimum use of space, while achieving maximum bathroom comfort. 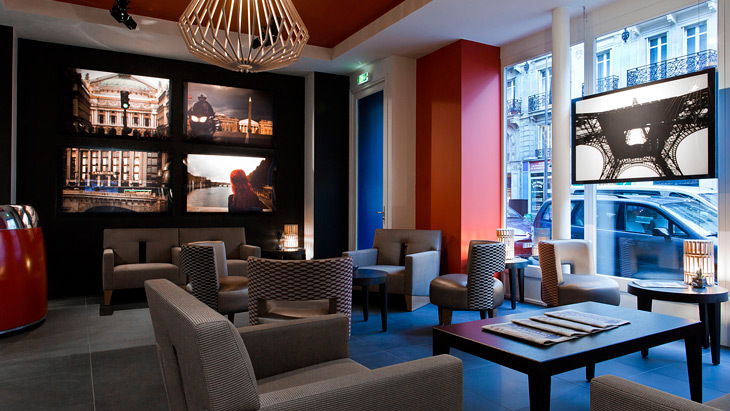 The Atmosphères is an innovative combination of designer/boutique hotel and art gallery, which is completely in line with its location in the artists' quarter of Saint Germain. Hotel guests are immediately captivated by the 112 select originals by renowned photographer Thierry des Ouches, which are permanently on display. The large-scale pictures, which are distributed throughout the hotel, acquaint guests with the character and distinctive features of Paris. And they also provide the inspiration for guests to go and make their own discoveries in the city of love.